Standardize your new hire checklist so teammates get up to speed faster, feel secure in their new role, and are more engaged. While the hiring process is often lengthy and effort-intensive, preparation for a new hire’s arrival can sometimes be rushed. It’s tempting to pull together some docs and call it a day, but there’s more coordination that needs to happen to welcome new employees and empower them to succeed. By standardizing your onboarding process and using an actionable checklist, new hires get the information they need to be successful and you don’t have to reinvent the wheel every time. Standardize your onboarding process. Give each new hire a consistent experience and help make sure new hires are focused on the most important onboarding steps. Collaborate with cross-functional teammates. Onboarding a new hire usually invovles working across several departments to ensure everything is in place. Keep track of responsibilities and timelines by assigning tasks with due dates. With Asana templates, you can create a welcoming and effective onboarding experience for both you and your new teammate. See how Olo crafts the complete onboarding experience to create excellent company culture. Our template gets you started, but our blog is chock full of tips to help you save more time. Equip new hires with everything they need to onboard successfully—before their arrival. 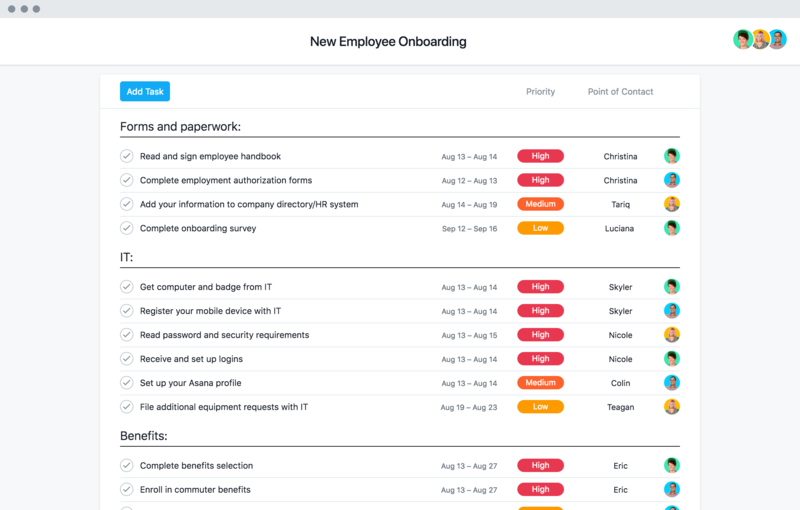 Standardize new employee onboarding with templates in Asana Premium—so new hires can hit the ground running.